Movistar Yamaha MotoGP’s Maverick Viñales and Valentino Rossi kicked off the first of the overseas triple-header weekends today with a dry FP1 session and a wet FP2. They secured fifth and ninth place respectively in the combined free practice results as they prepare for Sunday’s Motul Grand Prix of Japan, Yamaha’s home race. Viñales booked steady progress in the morning practice. 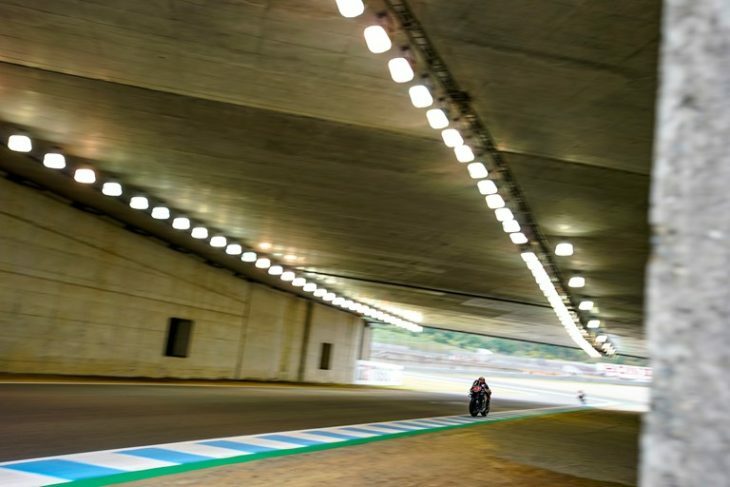 He started the weekend off getting re-familiarised with the Twin Ring Motegi track. He never rode on a Yamaha in dry conditions there before, as last year’s race was completely wet. He wisely took some time to warm up the bigger carbon brake disks, which are obligatory due to the circuit’s heavy braking character, before putting his head down in the final 15 minutes to gradually move up and take second place at the end of his penultimate run. He put in a soft rear tyre for his final outing and improved his time to end the session in fifth place with a 1’45.640s lap, 0.282s from first. The second 45-minute session started out in the wet, but the uncertain conditions didn’t halt the Spaniard’s afternoon riding programme. He was one of the first riders to brave the damp track, diligently working on his bike’s setting. He spent a large part of the session near the top of the provisional rankings, until towards the end, as the track dried, the second half of the rider field also put in a fast lap. The youngster’s fastest time of 1’54.133s was 5.997s from the top and left him in 15th place in the FP2 timesheets. However, as the FP1 results were quicker, he remains in fifth position in the combined free practice times. Teammate Rossi set the second fastest time at the opening stages of FP2 before starting to test various setting options as well as some tyre specs, knowing the Motegi track is heavy on the tyres. The nine-time World Champion got most of the work done before he decided to put in a hot lap with a fresh medium rear tyre, because the conditions for the remainder of the day remained uncertain. He managed to find time on his very last lap, securing ninth place with a 1’46.329s, 0.971s from the leader. The Italian’s notions proved to be right. At the start of FP2 it soon became clear no MotoGP rider would be improving on his morning time in the wet weather conditions. The Doctor put all his attention towards improving his feeling in the wet and calmly worked on the balance of his bike. He clocked a fastest time of 1’54.078s, 5.942s removed from the afternoon’s fastest lap, but still holds ninth place in the combined session results. The Movistar Yamaha MotoGP teammates were joined on track by wild card rider Katsuyuki Nakasuga, seven-time consecutive premier JSB1000 class (All Japan Road Race Championship) winner, who also won the Suzuka 8-Hour race four years in a row in 2015, 2016, 2017, and 2018. He started the weekend securing 15th position in FP1 and climbed up to a promising 12th in FP2 in the wet conditions. The results put him in 15th place in the combined free practice times, with a 1’46.872s best lap, 1.514s from first. Monster Yamaha Tech3 rider Johann Zarco initiated Friday in Motegi with a stunning third fastest time, after getting up to speed quickly this morning. In mixed conditions during FP2 the fast Frenchman was leading away most of the session and eventually changed to slicks towards the end. However, he concluded the day superbly as the best Yamaha rider, just 0.125 seconds off the top. On the other side, Hafizh Syahrin had to learn the Twin Ring Motegi aboard the Yamaha YZR-M1 for the first time today. In doing so, he rode in changing conditions in the course of the first day and improved his feeling this afternoon to finish the second Free Practice as the sixth fastest rider of the highly competitive MotoGP field, eager to get back on track tomorrow at 9.55 local time (2.55 CET) for FP3.